It has been busy weekend with Diwali (and Halloween) around the corner. I couldn’t be happier. Despite all the effort that goes into planning, festivals are always fun. For me, Diwali (festival that reveres Goddess Lakshmi) always brings good cheer. The nostalgia associated with decorating the home with lights and flowers, to dressing up in festive clothing, makes it special, year after year. This year we decided to spend Diwali in Singapore, unlike other times where we spend it at our home in Mumbai. To ring in the mood (Singapore obviously isn’t decked up like India is), I decided to stroll around the Diwali bazaar in Little India. 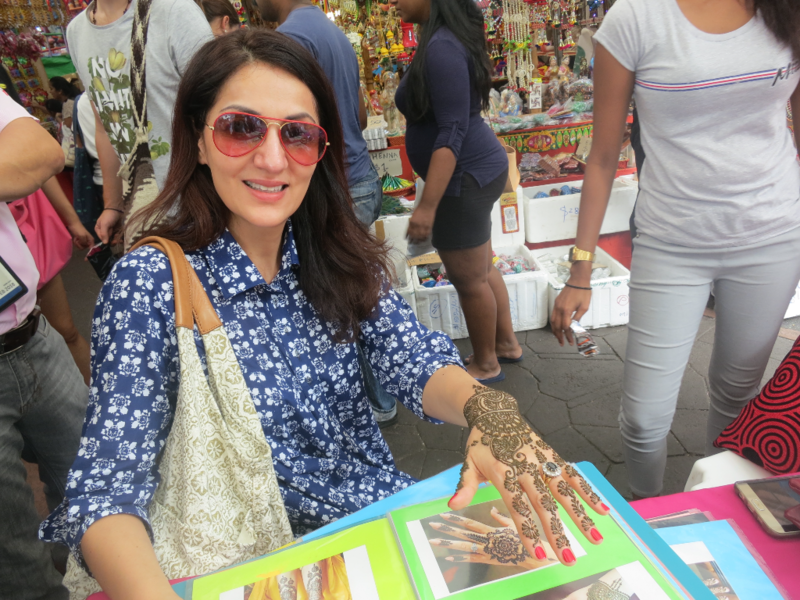 A trip to the bazaar, was recommended by a dear friend who also suggested a henna tattoo for my daughter. I was excited. One afternoon, we made our way to Hastings Lane in Little India, where the Diwali bazaar is held. I wondered how I would wade past the swelling crowds, with my three-year bubby in tow, but we slowly took to it. 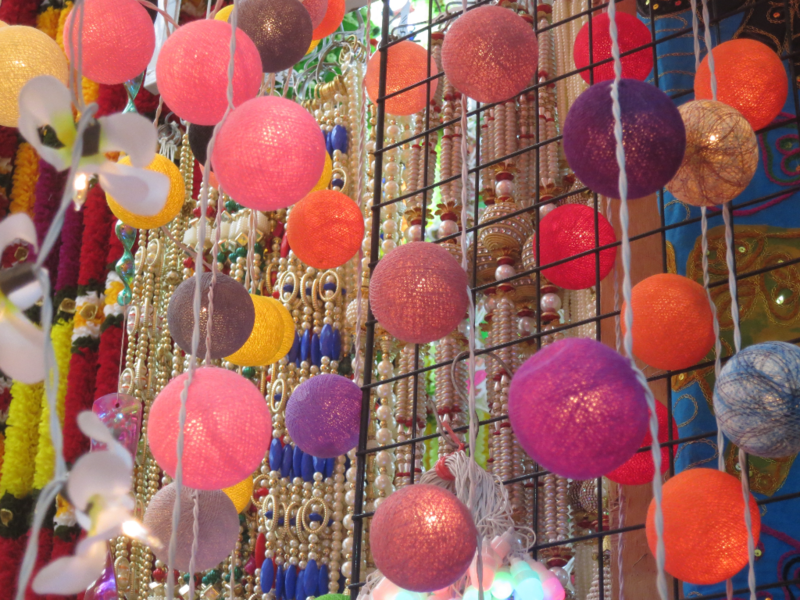 The Diwali bazaar is a kaleidoscope of colours. 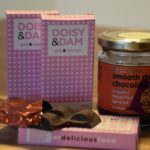 Everything that you need to celebrate the ‘festival of lights’ is possibly here. The entrance is lined with a huge stall selling fireworks. 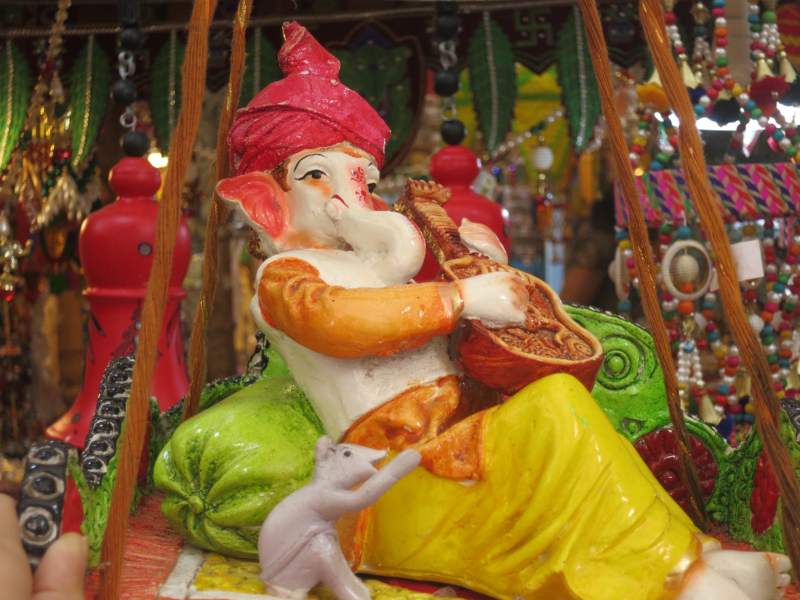 As you meander along with the crowd, you will see stalls selling idols, diyas, flowers, food items and other decorative supplies. 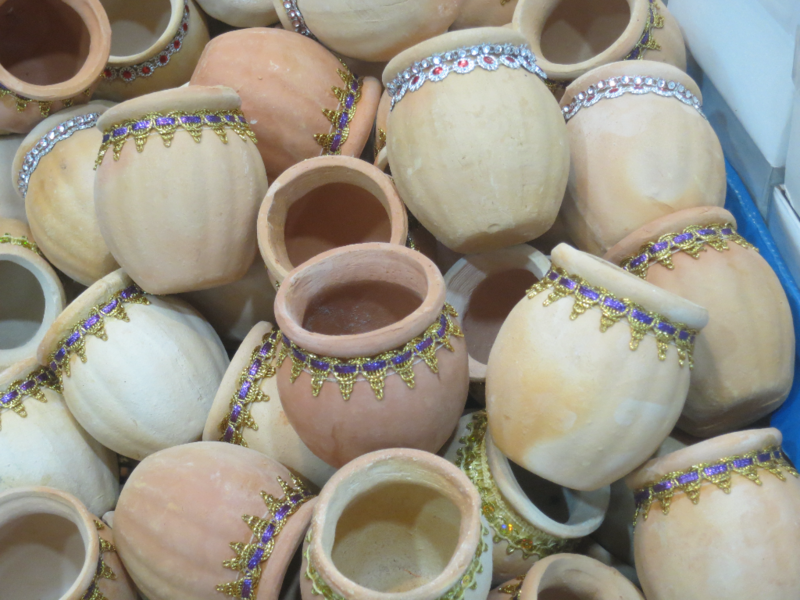 The collection of diyas (oil lamps) is amazing. The painted diyas with mirror work though fairly common are still pretty. 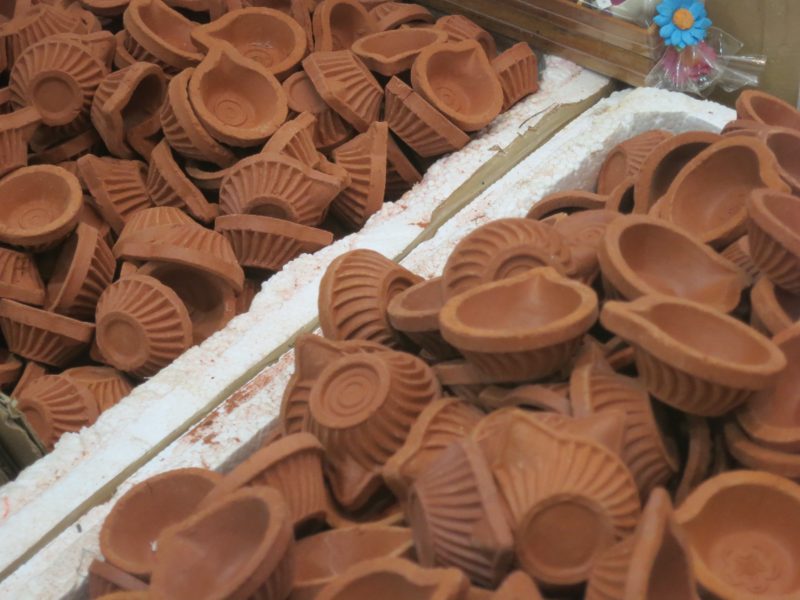 What appealed to me the most, were the clay diyas adorned with fancy threadwork. We got back a few clay diyas for my daughter to paint. 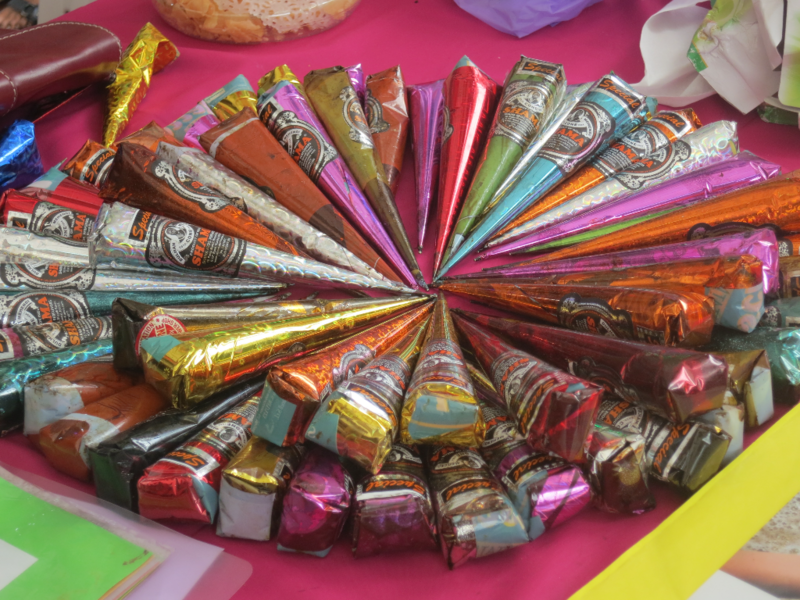 It was a fun afternoon craft, and the result was a plateful of bright and colourful diyas, all ready to be lit up. If you are looking for Indian outfits, the collection at the bazaar is perhaps not the best. 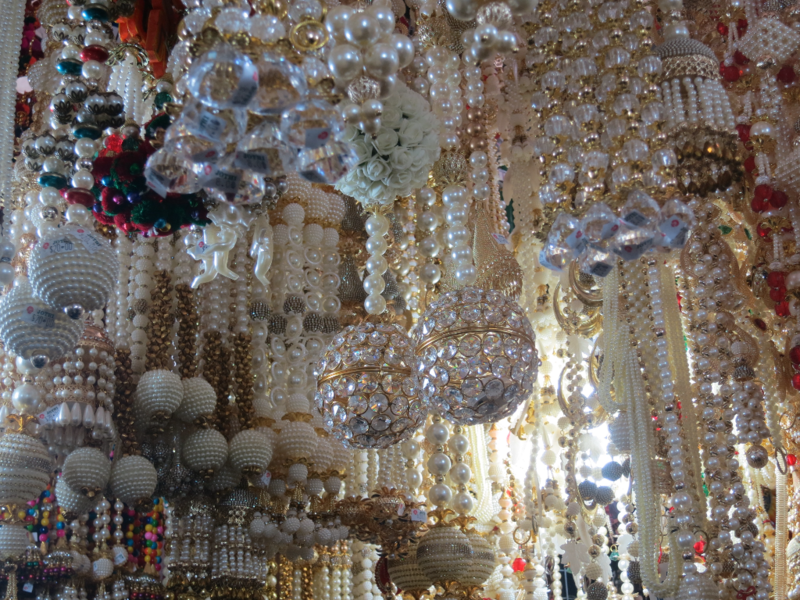 However, for bric-a-bracs like bangles and bindis, the collection is huge. Don’t forget to check out the stalls festooned with beautiful lights. 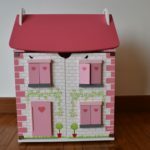 From small fairy lights, to paper elephant and flower lights, they have everything to brighten small balconies and large outdoor spaces. Don’t be surprised if you see vendors selling bags, boxes and other craft supplies from Thailand and Indonesia, but this is at the tail end of the bazaar. 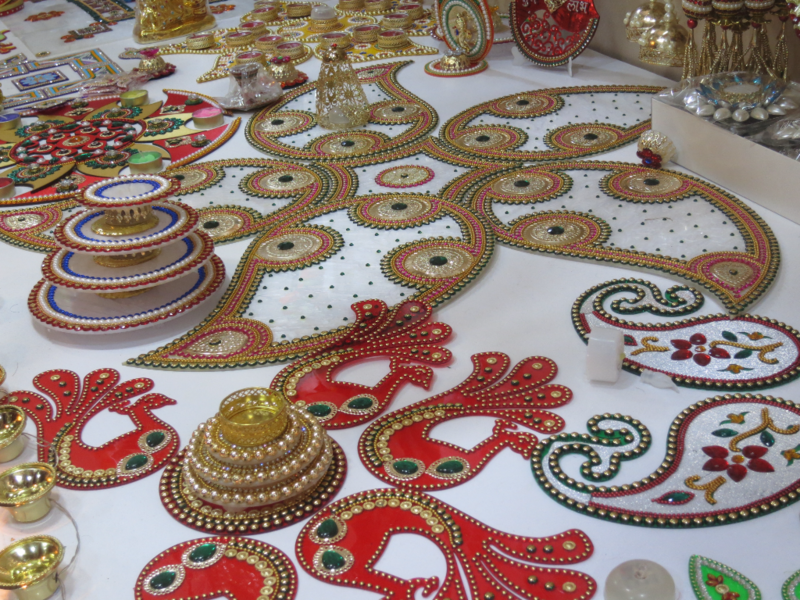 Diwali isn’t complete without a Rangoli, and the bazaar has all the supplies to help you make one. 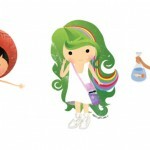 From the traditional powders to coloured rice supplies, they have it all. 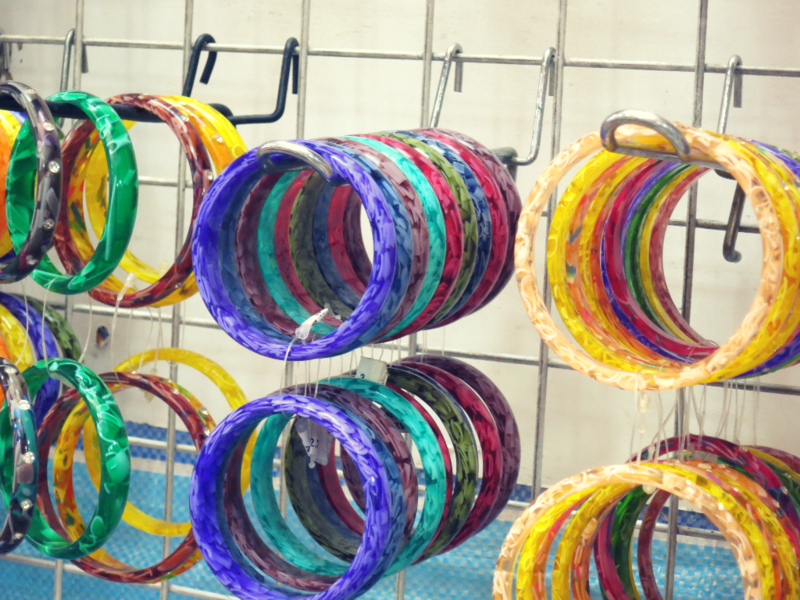 For time-strapped ladies, the readymade Rangolis are worth checking out. They look stunning at entrances, and even more so when combined with colourful oil lamps. 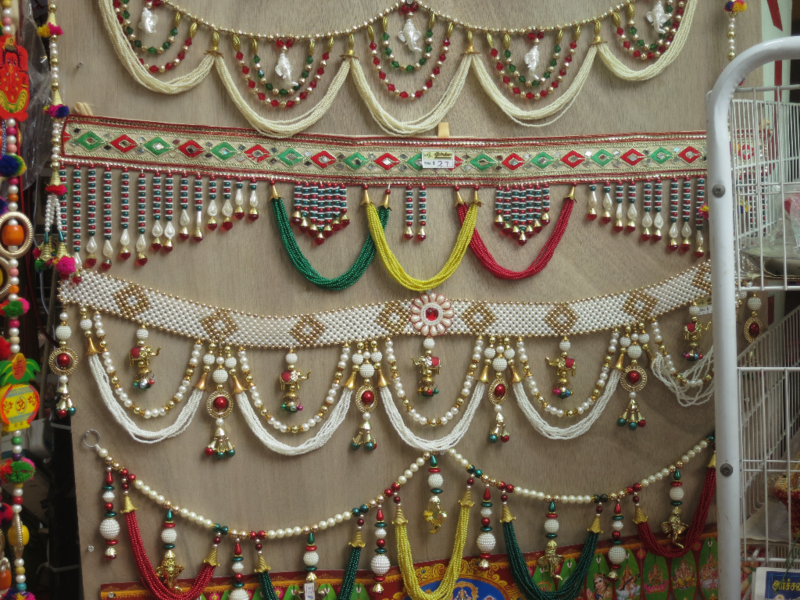 Once you are done strolling through the bazaar, take a seat at one of the mehendi booths. We went back another day, but trust me it was totally worth it. The friendly mehendi artists will embellish your hands with designs of your choice, in a matter of a few minutes. My daughter was excited to get one, as much as I was. Her first time ever, it was pure happiness watching her wait patiently to have a little flower pattern adorn her tiny hands. 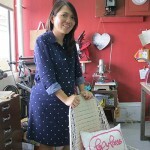 On our previous visit, we checked out some of the stunning designs that the ladies were making. This year, we will definitely miss the chaotic fun that Diwali in India brings. Nevertheless, we are hoping it is still a special one. Wishing all of you a very happy festive weekend.